What Is the Difference Between Pressed and Burned CDs? So you've recorded enough songs to make an album - congratulations! Now you have to decide whether you want to distribute your music digitally or make hard-copy CDs or even vinyl albums. While CDs are not the dominant medium for music distribution that they once were, some listeners still prefer them. 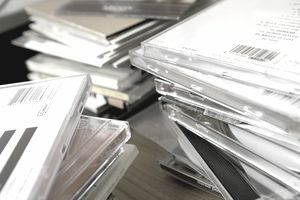 It's up to individual musicians to determine whether their fans are more likely to want a hard copy of the album, and since there are some significant costs involved, creating CDs doesn't make sense for everyone. When you decide to manufacture CDs, especially short runs, you will face a choice between getting pressed CDS or burned CDs. Pressed CDs are also sometimes referred to as replicated discs, and burned CDs are sometimes referred to as duplicated discs. When you see the difference between these two manufacturing methods, you'll see why those terms make sense. Replicated discs — or pressed CDs — are what most people think of when they think of CDs. Manufacturing is sometimes referred to as "pressing." With pressed CDs, the manufacturer will take the master disc you submit to them and create a glass master. That glass master is then used to create a nickel stamper and polycarbonate substrates that are metalized. This process produces an exact replication of your original master so that your final product sounds exactly like that master. You can think of this as "professional grade" — when you purchase a CD that has been released by a record label, it almost certainly is a pressed CD. Duplicated discs — or burned CDs — is what most people are making when burning CDs at home. A manufacturer uses music you've submitted on a CD-R and burns it onto additional CD-Rs for you. Manufacturers can complete the process on a larger scale more quickly than you (burning one disc at a time on your computer). So, to burn or to press, that is the question. The answer depends on the size of your order, your budget, and what you hope to do with the product. Duplicated CDs are a good choice for very short runs of CDs because you can order only as many as you need without the expense associated with setting up a glass master. If money is an issue, burned or duplicated CDs are the budget-friendly choice for small runs. If you need bigger runs of product — several hundred or more— then replication is probably your best bet. Replication does produce a slightly better product, especially since some car CD players have trouble with CD-Rs, and when you get into larger product runs, the cost of setting up the master becomes more reasonable. You also need to consider your goals for your project. There's nothing wrong with selling CD-Rs at your shows (price them accordingly) or using CD-Rs for promotional purposes. You can also sell them through your website and many online retailers. But some retail stores won't sell duplicated CDs. If you're looking for major retail distribution and hope to be on lots of store shelves, replication is likely to be your best bet. If this is your goal, the size of your order may dictate that you choose replication anyway. But if you're in the gray zone — say, you want 400 or 500 units — opt for replication if you're hoping for a retail push. Both CD duplication and replication can be fine choices, so don't overspend to get replicated CDs on small runs just for the sake of appearance or for the sake of that one fan with an older car whose CD player can't handle the CD-R. Instead, choose the one that makes the most financial sense for your album and take it from there.